The first woman to become a Sergeant, Vera Webberley, was also the first woman to be awarded the prestigious Queen’s Police Medal for distinguished service throughout her 27-year policing career. 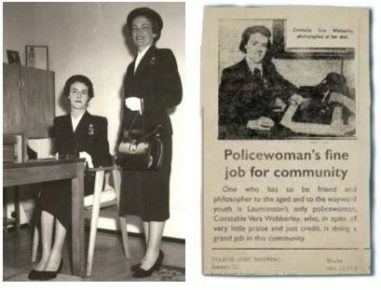 Described as “slim and efficient in her navy twill suit” and “always ladylike and formal”, in 1960 she became the Sergeant in Charge of the Police Women’s Section in Hobart and held the position for 11 years. As a Sergeant she was always interested in the welfare of her “ladies” and the improvement of their working conditions. Vera joined in 1943, and in 1945 she was the only policewoman employed in Launceston. At that time her duties included meeting the arriving passenger ships and trains to ensure women and children had adequate accommodation. She also visited hotel bars to ensure they were not allowing entry to women under 21. An article in The Examiner in 1945 said she specialised in “putting wayward young girls back on the straight and narrow path” and showed them “sympathy and understanding”. She said their “home environment and lack of parental understanding … had much to do with their waywardness”. An article in The Mercury in 1952 described her “disarmingly gentle manner” but said she had also been known to “reduce a blustering 15-stone man to a meek and perfect gentleman”. Promotional opportunities were almost non-existent for women during her time. In 1960 there were only 10 female police officers based around the state, and they could only be promoted within the Police Women’s Section. Women’s roles were limited to the welfare of women and children, only becoming involved in normal policing duties when called upon to assist. Vera received a Commissioner’s Commendation for duties performed during the devastating 1967 Southern Tasmanian bushfires. Unfortunately she retired in 1971 before equal pay and the full integration of women into police duties. Above left: Policewomen Vera Webberley and Joy Grist. Above right: Constable Vera Webberley (recreated excerpt from The Examiner, 30 June 1945). This page -- https://www.police.tas.gov.au/about-us/100-years-women-policing-tasmania-police/first-women-tasmania-police/vera-webberley/ -- was last published on January 17, 2018 by the Department of Police, Fire and Emergency Management.